Emilee here, feeling very punny this morning, as seen in the above title (get it "Shark Weak" "Shark Week" bahaha I know it's early can I at least get a little chuckle for that one?) Anyways back to business, Sarah a lovely and adventurous lady sent us this Pinstrosity, although in my opinion it turned out adorable! Just a few small revisions and she is ready to hit the big time, here it is! Make sure you have an awesome knife (something Sarah said she wished she had). When doing a little research I found that for these kinds of projects it is helpful to have a "fruit carving knife" you can find a decent one on Amazon that isn't too expensive. Another point is that this was her first try at watermelon carving, so grab two melons before going all Da Vinci on "The Melon" and practice a bit, and if all else fails you have an awesome bit sized snack! Third, and I already said this, is all ornamentation, jazz it up a bit, by the cute shark candies and maybe stick a Swedish Fish to his tooth, make it fun! All in all not too shabby for a first time melon experience, just a few minor changes. Happy Summer Melon-ing! I have made this twice and with great success!! 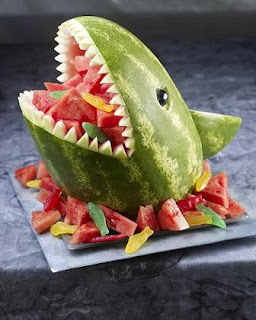 I put all kinds of fruit in it and cut fish out of watermelon slices with a cookie cutter and surround the shark! Absolutely cute!! I used a veggie peeler to get the skin off before I cut the teeth out. Worked out great. I think yours looks really nice too!! My husband and son won a contest with this. They place blue jello around it like water and used Swedish Fish for the fish. we did it for my sons party..big hit..but not as cute as the picture!